Yeah, this is one of those sports “fail”s. This took place during the Presidents Tournament at AUB, it’s the second one they host. American University of Dubai (AUD) and the American University of Beirut (AUB) were playing, and apparently things got messy with a red card. 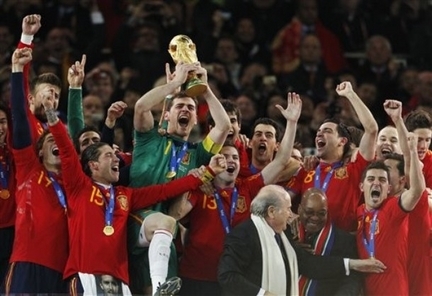 As I type this post up, the whole world now knows that Spain have been crowned as World Champions, over the Netherlands, at the 19th edition of the FIFA World Cup, held in South Africa. The whole world now knows that for a moment there, it really didn’t feel as though this was the very-much hyped final between two possible first-time winners. As a matter of fact, the game was a race to see who would collect the most yellow-cards, a feat accomplished by the Dutch in the 120-minute game. And after the whole world had accepted the fact that yet another World Cup would determined by penalty-shootouts, Andres Iniesta, the little Barcelona midfielder, worked his magic thanks to a pass from Cesc Fabregas, and ensured that the Spaniards would lift that glorious cup that evening. But everyone knows that, and if you don’t, I suggest you read a sum-up right here You know, just in case it comes up in a conversation sometime this week. As many have established by now, no one gets caught up in World Cup fever the way the Lebanese do. All the buzz surrounding Paul the Octopus’ predictions pale in comparison to what’s been going on here. The streets of Beirut have been decked out in other nations’ flags for around three months now. Wild enthusiasts have taken over Facebook and other social networking websites to show unyielding support for their team of choice. Fireworks have been blasted in the sky whenever a team won, or even lost, and celebration parties have gone on all night long. That’s not mentioning the most incredible ability that emerged this year: instantly organizing conveys that trekked most, if not all, the Lebanese roads. The Lebanese are so passionate about football, that they have gone out of their way to create a non-existing rivalry between Brazil and Germany, and even raise their children upon that. In fact, if one of these teams loses, which happened to both this year, fans would rather support the team the entire world considers to be complete opposites, than cheer on the other of the two. To everyone elsewhere in the world, the final was Netherlands versus Spain, but right here, it was the classic (Really?) Germany versus Brazil, decked in different kits. Football is exciting. Rooting for a team and witnessing their triumphs is gratifying. Which is why I can understand this sort of behavior, to a certain extent, of course. But this over-hyping fad just needs to go away, now, and the English are the greatest testament to its consequences. I’m no expert on soccer, but last time I checked, Lebanon doesn’t even have its own national team that can compete along with the Brazilians and the Germans. If we did, would we really stand behind them as we do for the others? I’m going to go out on a limb here and say, no. No, because being patriotic is an awfully hard thing to do for us and we’d rather support anyone that doesn’t evoke memories of our own country. I only wish that we receive some form of gratitude for all the support we pour in to those countries, like facilitating visa procedures, though that is a long shot. The World Cup is over now, and won’t be back for another four years. During that time, only a quarter of those who tuned in for the “Mondial” will watch club matches, while the greater majority will remain in oblivion. It’s a sad, sad fact, but at least in the meanwhile, we can assume that nothing of what went on this past month has ever happened.